High school is a strange time. For me, I like to frame that period as fraught with anger and rebellion. I tell myself that I was an artist trapped in a small town, a poet searching for his muse. The time when I was politically and emotionally alive. But then I look at the photos. Read some of the writing. And, oh boy, the truth crashes over me like an unwelcome but humbling wave of reality. The smoking without inhaling, the clothes from Structure (Burroughs didn't spend his paycheck at the mall), and the many, many, many configurations of embarrassing facial hair and coiffures, I was in desperate need of an identity. On the surface, it might not sound like I would have a lot in common with a teenage girl dying of cancer, but HOPE SPRINGS ETERNAL showed me otherwise. 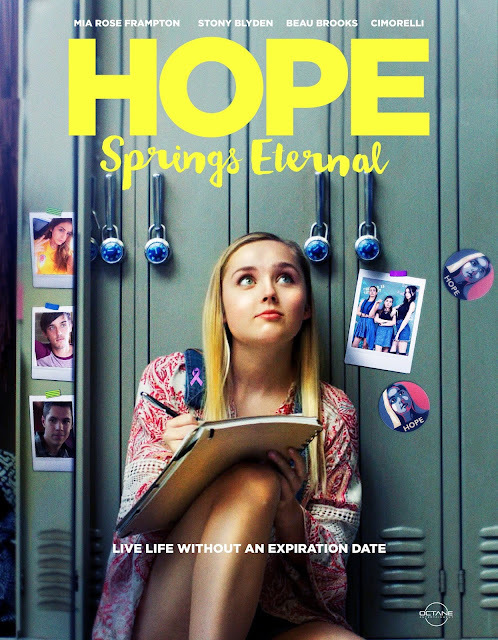 Hope Gracin (Mia Rose Frampton) has fully embraced her identity as the girl with terminal cancer. She's a vlogger and I assume that's the modern-day equivalent of the garage bands I putzed around with in the 90s. She see's herself as pragmatic with her approach to cancer. If people feel sorry for her, why not play it up? Allow teachers to pass her when she doesn't work and take a free coffee from the local barista. She might be dead any day, so why not? The problem is, she's eventually is given a clean bill of health. What do you do when you've built your identity around one thing and the world gives you another? I get Hope because I remember searching for my sense of self. Finding your voice is one of the true milestones of youth that's often brushed over in coming of age stories. It's difficult to believe that HOPE SPRINGS ETERNAL comes from a first-time screenwriter. The story fills utterly grounded and is surprisingly honest about what it means to be a teenager. The dialogue is witty without being overly clever and director Jack Newell allows the characters to be kids without ever looking down on them. Most films approach coming of age through the lens of KIDS or SHE'S ALL THAT. Films that are either warnings to never let your children leave the house or vapid nonsense. Don't get me wrong, I'm a fan of both KIDS and SHE'S ALL THAT, but I've never connected to either one on a personal level. If there is one, that means there are too many people that can relate to Larry Clark's vision of what it means to be young. And if you were an ugly duckling who was asked to the prom by the most dreamy guy in school on a dare, hat's off to you. That's one ridiculous senior year you had. HOPE SPRINGS ETERNAL uses cancer as a device to elicit sympathy for a kid who is acting... kind of terrible. Like we do when we are teenagers. That's the thing that really makes the film work. Hope is allowed to be a jerk. A self-involved teenager. In film, there is a tendency to treat disease with reverence. Any character who is stricken with cancer is handled with kids gloves. I get the cautionary approach to the subject matter, but it's not honest. Anyone who has had a loved one go through a medical crisis can attest to how long and complicated the process can be.